Even though it’s still the dead of winter as I write this and we are once again in the middle of a super-cold snap, the days are getting longer, and all that wonderfully fluffy white stuff some of us love and others of us despise is helping prepare the ground for spring and planting time. Snow is good for a garden because it covers and protects the ground and all those beneficial microbes living in the soil. The cold is also good because it helps kill off some of the pests that may otherwise be a problem in the spring. These two things seem to contradict each other and I can’t really explain away the contradiction. In fact, it is something I’ve always wondered about. I will have to look into that, but right now I have an article to write. 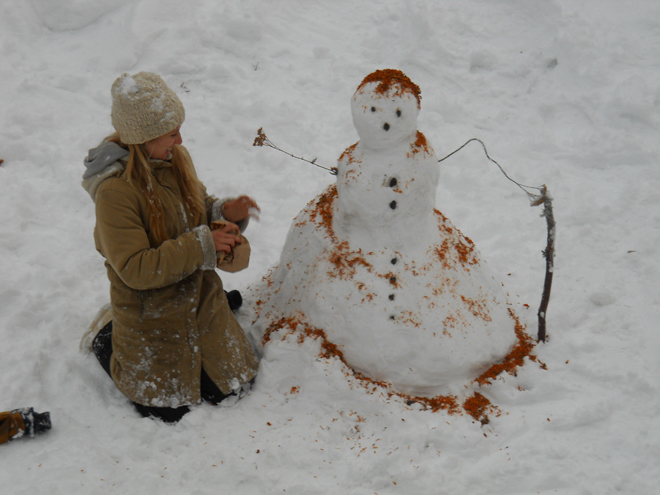 Decorating a snowman with marigold petals and seeds: a different approach to seeding. The first seed catalogue arrived yesterday, but of course it wasn’t addressed to me. It was a Richters catalogue. I haven’t ever spent much time perusing the Richters catalogue as most of my seeds have come from West Coast Seeds and William Dam. I had a moment of excitement when I opened the mail, “Yay, seed catalogues are here, and this one’s new!” Followed by a moment of, “Hey, wait a minute, why is there only one?” and, “Why this one?” and, “Oh, this isn’t for me.”And then came the horrifying realization, “Oh no, I didn’t change my address! I’m not going to get any seed catalogues!” Panic set in. But it’s okay, really it is. It’s only January. And the Richters catalogue that has now taken up residence in our bathroom is serving to whet my appetite for catalogues yet to be seen once I contact my favourite seed companies and request an address change. So far I have chosen four varieties of cilantro, but really I’m only saying I’ve chosen four when in reality I have chosen seven and am just hoping to narrow it down to four before I order seeds. Last year I didn’t order seeds. After market gardening for the last seven years I had a lot of leftover seeds. I knew I’d be moving in April and so wouldn’t be starting anything of my own. Instead of buying new seeds, I did germination tests on the seeds I had leftover from previous years and then bought a few packets of things I had run out of or didn’t have luck germinating. I was happy to discover that Beaver Valley Feeds in Williams Lake now carry West Coast Seed packets in the spring. I also bought tomato seedlings from trusted friends at the farmers’ market. I did plant onion sets because after the move it was way too late in the year to start anything but green onions from seed. Now, let me explain all of that for those of you who may not know what I’m talking about because you don’t happen to be market gardeners. Germination tests: these can be performed in a number of ways and are a good idea if you have seeds from previous years and want to know if they are still viable. I use the sprouter that I use to grow sprouts in the kitchen all winter (which reminds me, where is my sprouter? I haven’t seen it since I moved). If you have a sprouter, you know what to do. Place the seeds you want to test on the tray, fill with water, allow it to drain, repeat daily and wait. evaporation, but you don’t really want to drown the seeds either. Check your seeds daily and be patient with some. Some varieties germinate overnight; others can take a few weeks. Seedlings: It is fine to buy seedlings; not all of us have the time to start our plants ourselves and it’s great to start supporting your local growers early in the year. In fact, seedlings are like any baby creature: they are needy. They need the right temperature, the right amount of water, the right amount of light… they are not easy. So yes, by all means, when the time comes, buy your seedlings, but do know the person you buy from, if possible. You can end up importing pests and diseases you didn’t have before if you are not careful about where your seedlings are coming from. That said, we have wonderful local producers who grow healthy, pest-free seedlings and I trust them. I have only had a bad experience once when I inadvertently imported aphids to my greenhouse after a friend gave me a few new varieties of tomato plants that neither of us noticed were infected. Be sure to buy plants that look healthy and do inspect them for hidden pests. Onion sets: these are the little onion bulbs you buy and plant rather than starting the onions from seed in February or March. The one issue is that they can come with onion root maggot, and that little guy is nasty. Rotting, maggoty onions are one of the grossest and most disappointing things I’ve come across in the garden. But since you are probably not growing thousands of onions, it’s probably not really such a problem, and again, the benefits for most people far outweigh the risks. So while the snow continues to fall and the mercury continues to drop, start thinking about your garden dreams for the coming season, but don’t panic—that corner spring is just around is still stuck in a blizzard. Terri Smith is a non-certified organic vegetable farmer in the Cariboo. She is passionate about writing, art, goats, and feeding good food to good people. She believes in following your heart, living your dreams and taking care of the planet.